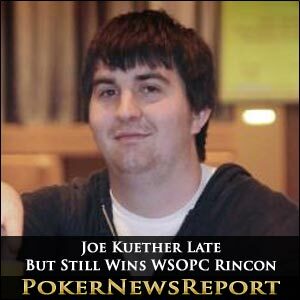 Las Vegas-based Joe Kuether has pocketed $111,104 for winning the World Series of Poker Circuit (WSOPC) Rincon main event at the Harrah’s Rincon (San Diego) Casino & Resort – despite arriving a few hours late for the start. Wisconsin native Kuether outlasted 331 other players to claim the top prize from the $1,600 buy-in No-Limit Texas Hold’em tournament, as well as his first WSOPC gold ring and an entry to the $1 million guaranteed WSOPC National Championship – a WSOP gold bracelet event – on Friday, July 6, for three days of play. What is truly remarkable is that the 24-year-old cash game specialist was about 200 miles away from the casino when play on the three-day event began as he was still driving to the tournament. However, the eventual champion did, of course, make the event – if four hours late – to actually end the first session above the chip average. Incredibly, by the close of Day 2, the University of Wisconsin graduate had made the final table fifth in chips as he aimed to erase the disappointment of finishing seventh – for $29,686 – at the $1,600 buy-in No-Limit Hold’em main event at the WSOPC Caesars Palace in Las Vegas back in January. That is exactly what he did, taking on all-comers to show great temperament and skill to battle to the title after seven hours of play at the final table on the 14th stop of 17 on the WSOPC schedule. The Rincon champ has now made an incredible six final tables this year, winning the last three events – all this month – for a rather healthy $191,083 in total for 2012, so far, and had to be at his best to secure this latest tournament crown by overcoming the likes of Freddy Deeb at the nine-handed final table. But Kuether saw off the challenge of the experienced Californian to eliminate Deeb – who had started the final table as chip leader – in fourth place. The Long Beach pro – who has two WSOP bracelets and a gold ring for taking down the first WSOPC event in January at The Bicycle Casino in Bell Gardens, California – struggled at the final table to eventually lose out to Kuether when his A♣ J♣ could not come from behind to beat the A♦ K♣ of his opponent. 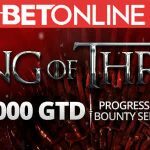 However, Deeb – with $37,167 to add to the $171,810 he earned in January – has now taken his live tournament earnings to approximately $7.85 million, so he probably won’t be too unhappy. With 34-year-old Californian Ryan Gentry hitting the rail in third place for $50,108, the event came down to heads-up play between Kuether and Arizona’s Chris Cronin, who held a small chip lead over his rival for the WSOPC crown. The lead changed hands several times before Kuether took a healthy advantage following his success in more than a few pots – and completed the job when minimum raising on the final hand of the tournament, to be called by 45-year-old editor and businessman Cronin. The dealer placed K♣ 4♦ 2♥ on the table for the flop, with both players checking. However, when the 7♥ arrived on the turn, the action picked up. Cronin initially checked, only for Kuether to bet 125,000. Not to be outdone, Cronin check-raised that to 300,000, before Kuether moved all-in and was called by the former. Cronin revealed K♠ 9♠ for top pair, but was seriously dominated by Kuether’s A♥ A♣ hole cards. The Elm Grove player just needed to avoid a king to be champion, and was delighted to see the A♠ come on the river to give him trips and the title. Cronin left with $68,686 as runner-up, while fifth place and $28,998 went to 28-year-old Michigan pro David Funkhouser and New Mexico’s Leroy Spires – a 35-year-old engineer – picked up $21,414 in sixth. Californian software engineer Chris Bratene took seventh place for $16,617, Manhattan Beach’s Stephen Plache earned $13,081 in eighth from his first WSPOC event, and yet another California player, 32-year-old entrepreneur Ryan Buckholtz, pocketed $10,444 in ninth. Other notable in-the-money finishers included Vegas-based Canadian Brandon Cantu. The 31-year-old Vancouver native – who had earlier rampaged through the $1,080 buy-in No-Limit Hold’em event when winning $27,004 as he almost single-handedly reduced the event from its scheduled two days to just one – picked up $8,449 for exiting in 11th place. The two-time WSOP bracelet winner – with success in a $1,500 buy-in No-Limit Hold’em event in 2006 for $757,839 and victory in a $1,500 buy-in Pot-Limit Omaha Hi-Low Split-8 or Better tournament three years later for $228,867 – has now taken his lifetime tournament earnings from WSOP events to almost $1.8 million. Also cashing were four-time WSOPC gold ring winner Alexandru Masek, of San Diego, who collected $4,855 for finishing in 19th, while veteran Israeli pro David Levi pocketed the same amount in 20th. Additionally, Corey Cutrell, of Seattle, and Maryland’s Matt Chang – who already have WSPOC rings for earlier successes – earned $2,497 and $3,140 respectively for taking 34th and 30th places in a event that paid the leading 36 finishers from the $483,060 prize pool. Just four stops are left on this season’s WSPOC, with the next arriving at Iowa’s Horseshoe Council Bluffs from tomorrow until Tuesday, April 10, for 12 ring tournaments. The three-day, $1,600 buy-in main event kicks off on Saturday, April 7, with the winner again claiming a seat at the WSOPC National Championship, as well as the top prize and a gold ring.